With no shortage of advice from well-meaning but uninformed and unexposed bystanders, Christian pastors and ministry leaders in the 21st Century are faced with often overwhelming challenges, and few places to turn for the kind of care and coaching that can strengthen and enable their clarity, their marriage and their commitment to their calling. God has used the ministry of Standing Stone during the last decade to provide challenged leadership couples with the wisdom and wherewithal to pick up their pace and stay the course. Jim and Debbie Hogan were at the highest level and helped provide leadership at a wonderful church that was reeling from the loss of successive senior leaders whose continued service might have been possible had a ministry like Standing Stone been available for them and their spouses. Those years honed the Hogan’s for the calling that they've been refining and replicating through an amazing cohort of mentor couples now in position to serve the church by serving church leaders through Standing Stone Ministry. 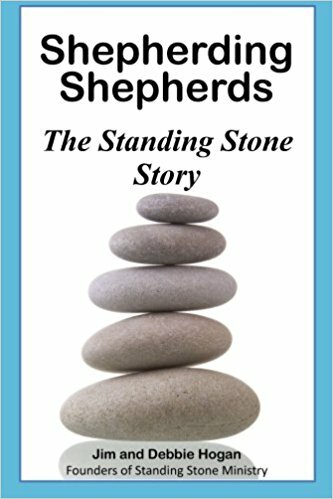 Shepherding Shepherds is a powerful story of God using ordinary people in an extraordinary way, and meeting a need that usually goes unnoticed among the faithful ministry leaders whose service deserves to be served.